The Agilent Bravo Metabolomics Sample Prep instrument reportedly can be used with any LC/MS system, and may be reconfigured for non-metabolomic workflows. Automating the preparation of biological samples is not as complicated as it is multi-faceted or multiplicative. Considering the hundreds of sample types, the downstream assays, analyses, or instrumentation, and finally the numerous ways to conduct extraction, drying, liquid dispensing, etc., one is left with one very large, very confusing matrix. The success of laboratory automation is testimony to vendors’ ability to cut through that big, ugly, multidimensional spreadsheet by focusing on elements of sample prep that remain the same: moving and tracking samples around the workflow through robotic workstations and laboratory information management system (LIMS), performing routine operations like liquid handling precisely and reproducibly, and exploiting macro-scale preparatory methods like physical separations or extractions at very small scale. The path to automating sample preparation is not always straight or predictable, particularly for processes involving liquid handling. Pipetting, the most basic liquid handling task, is prone to systematic and random errors. “Users get tired and make mistakes,” says Tristan Berto, market development manager at Gilson. With repetitive stress injuries common among pipette users, operators assume all sorts of bad pipetting practices to avoid discomfort. Gilson’s product lines include liquid handlers, autosamplers, and fraction collectors for medium-throughput sample and standards preparation, as well as multi-channel, motorized, and semi-automated pipettes that occupy an important niche between fully manual and fully automated workflows. Automation has traditionally been the territory of well-heeled companies and core laboratories that value high throughput. Today, with a recognized reproducibility crisis in life sciences, the justification for automating is as likely to be consistency as any other factor. 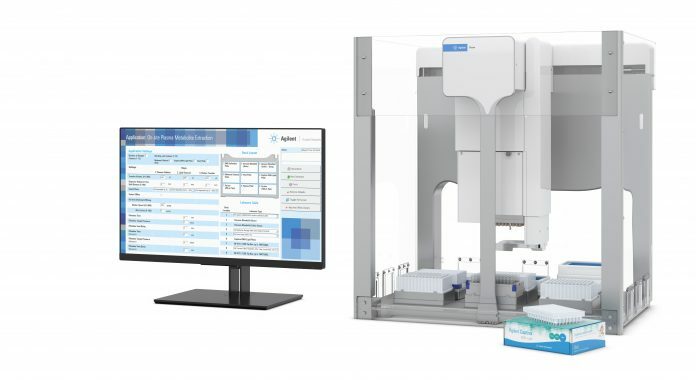 As a general platform for preparing a wide variety of samples, the Agilent Bravo Automated Liquid Handling Platform is simultaneously versatile and task-specific. The Bravo instrument can be adapted for proteomics, genomics, and metabolomics sample preparation—the latter optimized for prepping plasma samples. “Many proteomics labs are expanding into metabolomics because the analytical equipment, typically LC–MS, is similar,” says Henry Shu, product manager at Agilent. Of particular interest for metabolomics sample prep is Agilent’s Captiva EMR-Lipid reagent kit, which removes lipids from samples based on a combination of size exclusion and hydrophobic interaction, and precipitates proteins to boot. Removing lipids minimizes target ion suppression, which significantly improves method reliability and ruggedness. Because of their versatility, magnetic particles can be thought of as the “workstations” of biomolecular purification. To the extent that chemical hooks for specific analytes (molecules or cells) exist and they may be conjugated to magnetizable particles, magnetic separations are pretty much universal in applicability. AMSBIO supplies magnetic bead-based purification systems for next-generation DNA/RNA sequencing, proteomics, and diagnostics. The company offers stock bead kits and custom products that may be tailored to the application. Factors such as bead surface chemistry, bead density, magnetic properties, sedimentation rates, migration speed toward magnets, physical size, dryability, and flow characteristics can all be optimized for the job at hand. “Our chemistries are quite versatile,” explains Fred Whipple, PhD, a magnetic separations specialist with AMSBIO. “We use carboxyl, amine, thiol, aldehyde, tosyl, protein A, streptavidin, and other standard chemistries; and we can custom-conjugate our customers’ own chemistries, including antibodies, to beads. We can also incorporate detection components such as fluorescent or standard dyes (or exclusion of same), quantum dots, colloidal gold, and others.” One key focus area for AMSBIO is next-generation diagnostics. GeNovu specializes in software that transforms laboratory automation from an arcane, expert-driven process to a more democratized, user-friendly experience. GeNovu’s LIMS runs on the Microsoft Internet Information Services platform for the popular Windows environment. The upgradable package works with specific robotics systems from Tecan, Beckman, Hamilton, and other leading providers, and includes modules for complying with CLIA, GLP, GMP, and FDA Title 21 CFR Part 11. This, Cook says, requires knowing a “full stack” of programming languages, for example SQL for the database back end, the liquid handling programming language (which is often proprietary), plus coding in PhP, C#, or Java. Method transfer, from manual to fully automated workflows, is often cited as an impediment to sample prep automation (or adopting automation in general). Users feel that by losing physical contact with an extraction, for example not watching the phases separate or the beads collecting on the sides of a tube, the process is somehow getting away from them. Fortunately, the automation of most sample prep automation can occur a la carte, as we saw with Gilson’s semi-automated pipettes. Robotics, control and workflow software, and sample-tracking LIMS may similarly be deployed for discrete steps, or several contiguous steps, until customers are satisfied that assays are running within specifications. More often than not they will find that standards curves, analyte concentrations vs. sample size, and general precision/accuracy are much higher than when these operations are performed by hand. Most significantly, automation vendors want your business. With a firm understanding of the cost and complexity of their products, they are happy to guide purchasers through the acquisition and setup of automation systems. They will also assist in transitioning from manual to automated methods, which can involve everything from optimizing pipetting, controlling dispensing tips’ positioning, speed, blowout, and equilibration, and helping to specify labware appropriate for customers’ automation needs.